I need help with understanding recipes. I have just started mixing my own liquids and I am not mixing the right quantities of concentrates correctly. I am really confused and need some help, I am not very brainy, mathematical and I do not understand what to do. I have been speaking with a vaper I know but he is so far advanced and does not really want to help or guide me. I have been trying to workout the recipes on Steam Engine but do not know how to use that to workout concentrates I need to mix to get to an end result. I mainly make 60 - 100 ml recipes at 30 pg - 70pg with 3mg of nic. I have not been doing the calculations properly. 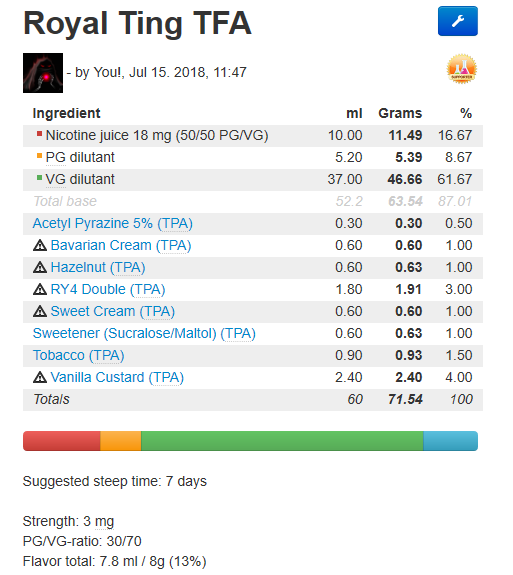 I buy nic shots here and I have been adding the nic in and leaving my liquids to steep and I was told that I should not do this as this will mess my ingredients and liquid up it is best to add when I intend to vape the liquid. I am using all the recipes only on E-liquids but sometimes the vg & pg is different to what I want to vape and also the final amounts are. 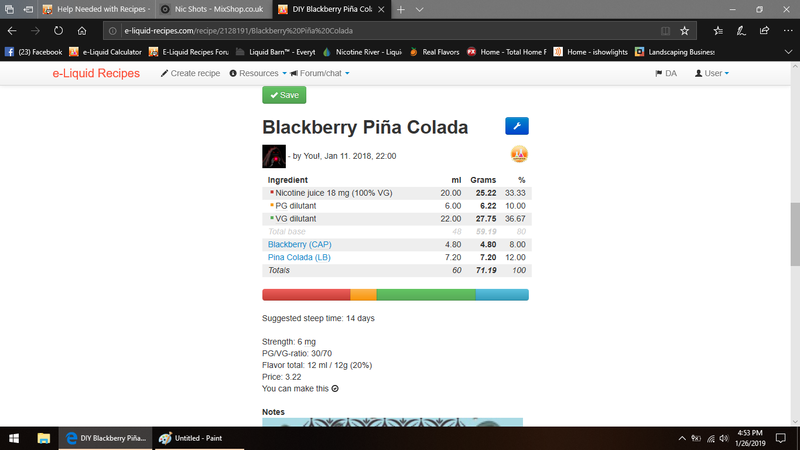 So when I adapt a recipe I was told this is not correct as I am not getting the right figures for what concentrate amounts to add to make my liquid. I am totally confused, thick and feel a right idiot please if anyone can help and make it simple so I can move forward without further mistakes. I really appreciate anyone’s help and guidance and thank you in advance. Welcome to the forum. I would start by switching over to the Beginners section. Beginners. You’ll have better luck finding answers over there. Have you tried the ELR calculator? but the elr calculator is capable of calculating different types of nic. Why? Start with 10-20ml and rather make more recipes, test, compare and test more until you find one that’s worth 100ml. I think I have managed to work it out on Steam Engine. I am based in Portugal and we have nic shots at 18mg 50/50. So for a 60ml mix I have to add 1 x nic shot which is 10ml. I have looked and prepared loads of recipes and they are all basically wrong. I thought I was saving so much money and just steaming through recipes I was so on form and so excited by what I had done and basically I have made the wrong recipes, I think. So I have managed to work out on Steam Engine what I need to do I think? I just thought that I would search for a recipe on E-liquids, change the vg & pg that I like to vape and then just change the nicotine level I vape which is 3mg. But I think what I need to do is look at the mixers recipe then add that into steam engine and the base that I like to get the true recipe/concentrate figures? 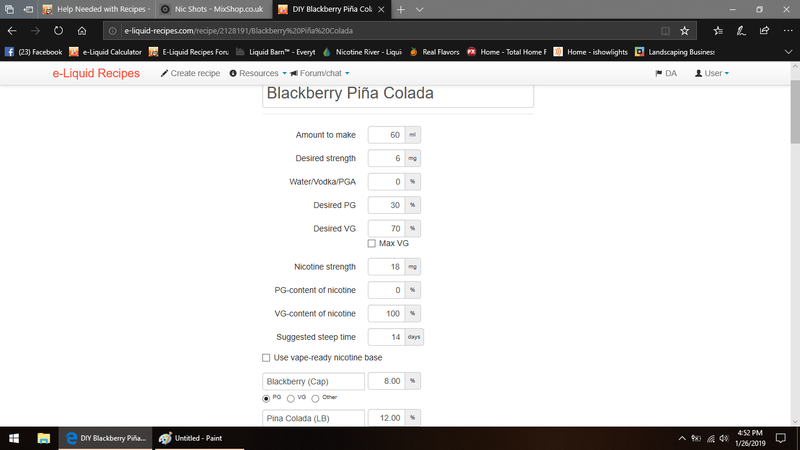 So here is one recipe I have been making but I think and know I have just made it incorrectly by changing the recipe on the e-liquid calculator instead of entering the amounts per concentrate on the steam Engine calculator with my base and nicotine. Thank you so much for your message and response. I think now I have managed to work everything out on Steam Engine. The nic shots I buy here in Portugal is 18mg 50/50 base 10ml for €5 they only sell here nic shots like this. It is heavily regulated by the government and you cannot buy in large quantities. out the door they just slag you off. So when you return it is tutut not him again. So this is why I started learning how to become totally self sufficient and buy everything online now. The only thing I need to buy in a vape shop is the nic shots as I cannot but nicotine online. But I know one vape shop that they are okay with me and the rest are just stupid idiots who see English people outsiders as stupid idiots as we are not Portuguese even though I am a Portuguese resident and have Portuguese resdencia. So when I was speaking about I make my own liquids they asked me what I do and how I did and basically told me I was making it wrong, they got p-off as I am not buying off the shelf liquids and basically laughed in my face and probably said when I left what a total idiot that guy is!! Yes totally agree and it was just me getting too far ahead of myself and not thinking the whole thing out properly. Now I have learnt from my stupid and rushed mistakes I can go forward now. I would start by switching over to the Beginners section. Beginners. You’ll have better luck finding answers over there. Thanks yes I appreciate your help and message. Yes I have my account on ELR where I have all my recipes and the ones I have saved in my favourites. Where do I make my settings for my nic and default values? Also I have been ordering my concentrates from an online website and I was told not to order through the company I have been doing. They do not send original concetrates from all the companies, Capella, TPA, TFA etc. They send their own bottles with their labels on and the names of the concentrates and companies names. So I do not know if I am getting the exact flavours and the correct taste and also could be watered down with extra VG or PG. So I am now going to order through a reputable Portuguese based company and also Chef’s Flavours I know most order through the Chef’s Flavours do they send original bottles or their own? Hi Got it thanks, thank you so much for your help. Okay thanks a lot of people mention to me to order from there. 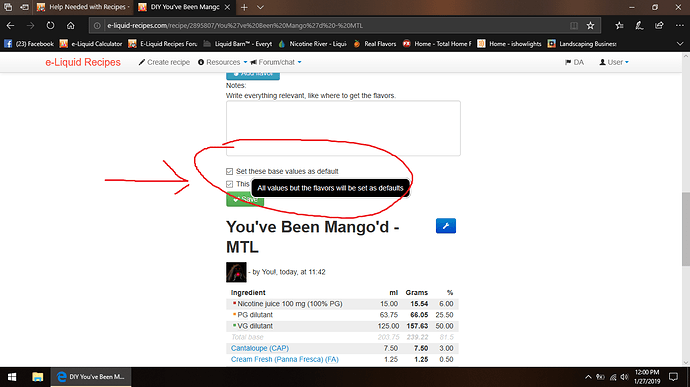 Okay thanks but at the moment I will have to select it in all the past recipes that I have saved and adapted to my requirements? basically laughed in my face and probably said when I left what a total idiot that guy is! !